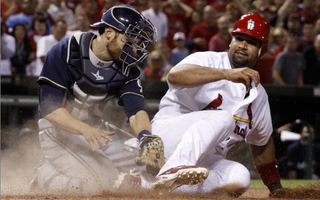 The Brewers and Cardinals faced off 18 times during the regular season, with each team winning nine. Since Aug. 30, though, the Cardinals took five of six. That stat matters. Oh, they apparently don't like each other, either. Jaime Garcia (13-7, 3.56) for the Cards. Zack Greinke (16-6, 3.83) for the Brewers. First pitch: 4:05 p.m.
Wonder what Front Row Amy'll wear for the whiteout at the first Brewers NLCS game since the year she blossomed into teenhood.